On the track, success for Mohammad Alhasan is measured in hundredths of a second and tenths of an inch. Victory and defeat comes in short bursts of speed and briefs moments of flight, with margins for error so slim one has no choice but to become familiar with failure. It is a stark contrast from the primary driving force in Alhasan’s life — his Muslim faith — in which the greatest rewards are earned through deliberate actions performed over long periods of time. In this religion, practice can in fact make perfect, and everyone can be a winner. 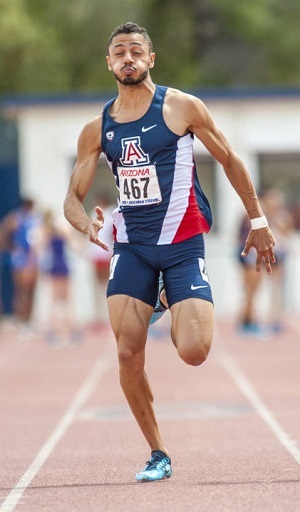 The 2014 season was by many standards a good one for Alhasan, a rising senior sprinter and long jumper at the University of Arizona. While the effects of an old ankle injury kept him out of the jumping pit, he did manage to clock personal bests in the 60-meter dash (6.75 seconds), the 100m (10.45s) and the 200m (21.29s). But at the Pac-12 Championships in May, Alhasan missed making the 100m final by 0.11 seconds, then missed the cut for the 200m final by an even more miniscule 0.08 seconds. In two blinks of an eye, two conference-title opportunities — and two chances for an invitation to the NCAA Outdoor Championships — were lost. But that is the nature of his sport. 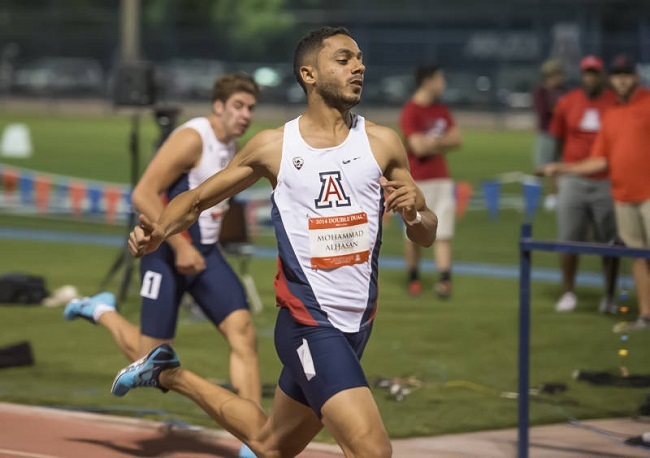 The fast track for Alhasan has taken him from Saudi Arabia, where he grew up and was a star high school athlete at Dar Al-Oloum in Safwa City, to the picturesque college town of Tucson, Ariz., where he is working toward a degree in mechanical engineering. He has accomplished a lot and appears headed for big things, but he still has a lot of running left to do. UMMAH SPORTS: What was the highlight of this past season for you? MOHAMMAD ALHASAN: I think running consistently faster than my previous season was the highlight of my season, especially indoor. I ran in the 6.75, 6.79 range in the 60, which gave me a lot of confidence going into next season because I’d never broken seven seconds before. Outdoor, I wasn’t really pleased because I wasn’t consistent in the 100. I ended up running 10.45, which was okay. For the 200, it is a pretty tough race, but training for it has made me change my mindset. In the past, I’d never get excited about the 200. That has changed now. Which events will you be competing in next season? Which event is your favorite? Jumping was the only thing I wanted to do. But to be a great athlete, you have to be willing to do some things that you do not want to do. Sprinting is one of those things for me. I used to think about it as a temporary thing just to get faster, because it is a great advantage for a jumper to be really fast. However, seeing the improvement I’m making, I’m starting to love being a sprinter. I want to continue to do both. Describe your offseason training routine. I made a decision to not compete this summer because I have schoolwork. So I took about five weeks off, just playing volleyball and basketball and entertaining myself. By mid-July, I started training again. My schedule consists of lifting mostly, but I also run weekly. If I go twice a day, I would have an afternoon session at the gym or a strength workout and then the pool at night. How do your diet and exercise routines change during Ramadan? My exercise schedule in Ramadan is mostly after sunset, but I will do a workout in the afternoon twice a week. This is doable for me; it’s not too hard. For my diet, I’m not a big fan of meats, but I eat some from time to time. I think vegetables are an essential part of a diet for athletes and non-athletes. This year Ramadan falls during your offseason. Has it ever fallen during the season? If so, how have you handled that? Luckily, all of my three years at Arizona, Ramadan has fallen during the offseason. In high school, I do not remember competing during Ramadan, but I remember how training was. We had a light workout before sunset, and then we’d come back again after breakfast. I liked the change of routine. It was in middle school. One of my best friends signed me for the 60-meter dash. I played table tennis for a few years. Were you always the fastest kid on the block, or the most athletic kid in school? In other words, were you naturally good at track and field? Are there any track athletes you looked up to as a kid, or maybe pattern your style after now? I like to have my own style, but that does not mean that I don’t look up to some athletes. I am a big fan of (U.S. long jumper) Dwight Phillips and (Moroccan middle-distance runner) Hicham El Guerrouj. Hands down, they are two of the greatest of all time. In high school, were you being recruited by U.S. colleges to run track? What about colleges in Saudi Arabia or other countries? Colleges and universities in Saudi Arabia do not offer scholarships for athletes. They have championships in multiple sports, though, but they are weak performance-wise compared to the U.S. I was never recruited by any institutions here, but I looked up how the system works in the U.S prior to my coming. I’m a walk-on at Arizona. Was that always your plan, to compete at a U.S. college? I preferred to stay in Saudi Arabia at first and join a sports club while attending a university. But things did not work the way I wanted, and I left for the U.S. a few months after graduation. I’m very thankful I didn’t stay. This experience and being out here is something irreplaceable. Of all the schools you could have picked, how did you end up at Arizona? I had a few other choices, but I preferred the University of Arizona because the school has a pretty good academic reputation. The weather is similar to where I come from, and they have one of the best track programs in the country. Also, my dad is an alumni of the University of Arizona. I was raised Muslim. Thanks and praise to God. What was it like going from a Muslim community in Saudi Arabia to a laid-back American college town? I come from a Muslim community that is completely different. We have different kinds of restrictions, rules, laws and expectations. Some pertain to our religion; others are merely cultural or governmental. Has it been challenging to maintain your Islamic principles while going to school in such a different setting? There are lots of distractions out here compared to home, but it is not a challenge. Thanks to my parents for the values they have taught me. What appeals to you about Islam? Submission to God, the message of the Prophet and his household. Simple things such as fasting, almsgiving, forgiveness, peace and purity of heart. There are lots of things, but all in all, Islam is perfect in every way. Have you been able to perform the Hajj pilgrimage? I have, actually. It was the experience of a lifetime. Millions of Muslims gather in Mecca and perform rituals, some of which are walking around Ka’aba seven times, going back and forth between Al-Safa and Al-Marwah, and what is called the stoning of the devil, among other things. Hajj is a pretty spiritual journey. Indeed, every true Muslim would love it. What do you think is mainstream America’s biggest misconception about Islam? There are plenty of them. Women’s rights in Islam is a common one. I advise people to look at the religion itself to find answers. Also, to look at the role of women in Islamic history, because what some governments do to women’s rights is irrelevant to what women’s rights actually are in Islam. How have you been treated by teammates, coaches, fans, etc., when they find out you’re Muslim? Has it been mostly positive or negative reaction? They are very respectful when it comes to my beliefs. Sometimes they ask me questions about religion, society and where I come from. I like that for they can know some cultural differences, as I have experienced many. I do not recall getting any backlash at all. What lessons have you learned from track that have helped make you a better Muslim? What lessons have you taken from Islam that help you on the track? What are you future plans on and off the track? On the track, my eyes are on big championships next year. Off the track, I hope my degree will take me somewhere I want, if Allah wills. May Allah Bless you and Grant you success!